Juniors – (Born in 2004 or later) – FREE. All Players will be entered into random door prize raffles just for signing up! Doors open and Registration begins at 8:00 AM and will close at 9:30 AM. All players MUST, MUST, MUST register online PRIOR to the event date. REGISTER HERE NOW! Check in will be done with Decklists… NOTE: ALL DECKS WILL BE CHECKED, SO HAVE THEM SORTED WHEN YOU ARRIVE. If you have poor handwriting, please consider using one of the computer generated deck list programs so we can read it! Click More for All the Complete details on the TCG and VG tournaments! The Pokémon TCG State/Province Championships do not require an invitation or qualification of any kind, and all players in good standing are welcome to participate. Results of the SPC can give a serious boost to a player’s Championship Points and chances of getting into the 2015 World Championships in Boston, MA. Registration closes thirty minutes before the event is scheduled to start. Any player who wants to enroll after registration has closed will be able to do so, but will receive a round one match loss. Players arriving after round two has been paired will not be able to enroll in the tournament. This event is open to all players. We are running this event using the Swiss pairing format, so you can play through each round and never be eliminated until Swiss rounds are over. State Championships are a great place to test your new deck strategies and bring your play skills to the next level! The top players of the State Championship are awarded prizes for the skills needed to do well in such a large event. For a copy of modified legal reprints look HERE! Top 8 will play 75 minute matches. 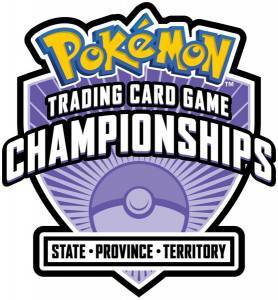 The Pokémon TCG State/Province Championships are run using the Standard Format and Age-Modified Swiss pairings. The number of Swiss rounds run will depend on total attendance at the event. Each round of Swiss is a best-of-three match, with a time limit of 50 minutes plus 3 turns. At the conclusion of Swiss rounds, the top players will compete in Single-Elimination rounds, with a maximum of 8 participants. See the Pokémon Tournament Rules for detailed information about the tournament structure. After checking your cards are legal for play, you will then need to fill out a DECKLIST! Or better yet, make it super easy so you don’t even have to write it out and use the Decklist Generator. If you are using sleeves be sure they are all the same color and size. Damaged sleeves will NOT be allowed for this event. Shiny backs or printed backed sleeves will also not be allowed. Prizes are awarded to the top players in each of three age divisions. First 250 players to register will get a special promotional item. All participants will receive 3 Play! Points and a Pokémon SPC promo card (while supplies last) just for playing! Top finishers will receive Championship Points as detailed on the 2015 Championship Points chart. The top 4 finishers in each division will receive a Pokémon TCG State/Province Championships trophy. TOP HALF OF REMAINING REGISTERED MASTERS AFTER SWISS ROUNDS – $20 IN Top Cut Central Vouchers* or website credits. (That’s right, you only have to be better than half the field to get your entry back in vouchers!) Top Cut Vouchers may be redeemed at the event, or receive remaining value in website credit. Vouchers may not be used for tournament entry fees. Top 8 Masters will receive an exclusive TOP CUT CENTRAL prize pack. What about Travel Awards and Stipends? Travel Awards and Travel Stipends to the North American National Championships are awarded to the top TCG performers in the season’s Championship Points rankings. *Byes earned by winning players apply to the National Championships event corresponding to the player’s nationality. A Canadian player is therefore eligible to earn a bye at the Canadian National Championships by winning an event hosted in the United States, and vice versa. Byes do not “stack.” If you have won a bye in another event, either a different SPC event or a Regional Championships, you will receive the largest bye you have earned. You will not receive the sum of all the byes you earn. Win-a-Mat – New Event! – VERY Limited Availability! Open to 24 individual pods of 8 players. 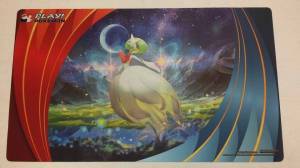 Prize: CUSTOM STATES SPECIFIC POKEMON THEMED MAT…. *Prizes based on age groups of 16 or more, and will be adjusted accordingly. There will be several smaller events such as, coloring contest, guess how many, drawing contest, etc., available for all to win additional prizes. Top Cut Central will be onsite with a full assortment singles and sealed merchandise. We will also be buying bulk cards at this event. For the most current buylist click HERE! While trading is fine, please note that buying/selling cards with anyone except for our authorized dealer(s), or soliciting to do so elsewhere, is strictly forbidden at this event. Failure to obey this rule may result in both the buyer and the seller being removed from the event, and banned from attending future events. Top Cut Comics also reserves the right to limit the amount of space being occupied by any one individual while trading, and does not allow the use of suitcases, handcarts, luggage carts, etc. to be used for the purpose of transporting excessive amounts of trade stock. We need to be considerate of all those around us. Come join us for day 2 of a fun packed weekend of states! Team Battle list will be needed! $5 entry Fee. Prizes will be awarded based on number of people in each age division. Hope to see you there! All participants will receive 2 Play! Points. In addition to Play! Points, Championship Points are on the line at all Premier Challenges, and these points help players build toward an invitation to Worlds. Check here for information on Championship Points. The Best Finish Limit for this season of the Premier Challenge is 5. Online Registration will be used: Please Register at:http://labs.pokegym.net/register/15-03-000202 in order to avoid hassles at the event site. Once registered you will need to check in the day of the event in order to insure your spot in the tournament. The Standard format is the standard tournament format for Play! Pokémon Premier video game events. This format will be used at all Premier events unless specified otherwise. Pokémon are allowed to Mega Evolve. Pokémon may not hold the item Soul Dew. Players may use Pokémon with Hidden Abilities. Note: Premier Challenges use the in-game timer: 90 seconds to preview your opponent’s team and choose your own Pokémon, 99 seconds to choose a move, 60 minutes for the entire game. Premier Challenges do not require an invitation or qualification. All players in good standing are welcome to participate. Players must bring their own system in the Nintendo 3DS family, Pokémon X or Pokémon Y Game Card or downloadable version, and charger. Players must have a Pokémon Trainer Club account with a Player ID attached, and they must have opted in to the Play! Pokémon program in order to earn points and awards. Age-Modified Swiss pairings, with single-game matches. After Swiss rounds, a cut to a Top 8 single-elimination finals, attendance permitting. Single-elimination finals will be run as best-of-three matches.